One day a year when much of the world sets aside for one to show someone in particular how much they are loved. Should we not show our love for Yahweh and Yahshua every day? The month of February has for a longtime been used as a month in which much of the world celebrates a day that has been set aside as a day to show one’s love toward someone. Some feel that by not celebrating this day that one is unable to show love towards others. One has to be a little leery about celebrating such days because there might be some underlying reasons why it is not found in the Scriptures. One must therefore look into history to find how this celebration began. As it turns out, this day had many different beginnings which were eventually combined together. It may surprise you that Valentine’s Day came from the same place as many other seemingly innocent secular pre-Christian observances such as Christmas, New Year’s Day, Easter, and Halloween. These days can be traced directly to earliest pagan history. The “universal church”, as she did with all these other observances, selected a popular pagan holiday, adopted it, and dressed it up with a “Christian name.” And, what is this special day which seemingly has no pagan attachment? Valentine’s Day! What was Valentine’s Day first called long ago? Its original name was Lupercalia. It was celebrated thousands of years before there were any people known as Christians or saints. Lupercalia was known in Roman mythology as an ancient Roman fertility rite or Feast of Lupercus, which took place on February 15. This rite was named after a Roman god named Lupercus who was said to watch over the shepherds and their flocks and keep them from the wolves. This feast was celebrated every February to honor Lupercus so that no harm would come to the shepherds and their flocks. Lupercalia is also a celebration to honor the mythical founders of Rome, Romulus and Remus. 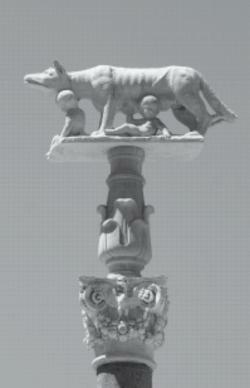 It is said the wolf Lupa suckled Romulus and Remus in a cave named Lupercal. Later, priests (called Luperci), dressed in goatskins, would sacrifice a goat (symbol of fertility) and a dog (symbol of protection) to the gods, anoint themselves with the blood of the sacrifices and then run through the streets whipping onlookers with a thong made from the goat’s skin. These thongs were called februa and the lashing the februatio, both stemming from a Latin word Februarius (February) meaning to purify through sacrificial offerings. Women in the city placed themselves in positions around the streets so that the priests could strike them with the februa to assure these women of fertility and easy childbirth. In another part of the celebration, priests would pair up the young men and women in the city by writing down the names of the girls and collecting them in a box. Boys then individually drew the girls’ names from the box, and became paired with them until the next years’ Lupercalia celebration. This same festival was also used to honor Juno, the Roman goddess of women and marriage, and Faunus (associated with Pan), the god of nature. On the eve of this festival a lottery was held. Names of teenage women were placed in a box, teenage men drew a name and they were paired up for one year. At the following year’s Lupercalia, another lottery was held and the process continued. Webster’s Universal Unabridged Dictionary defines Faun (Faunus) as a class of rural deities represented as men with the ears, horns, tail, and later also the hind legs of a goat. Traditionally, mid-February was a Roman time to meet and court prospective mates. Over time the lottery as associated with Lupercalia was replaced with a lottery where both men and women were allowed to draw from the box and now this box contained the names of saints. 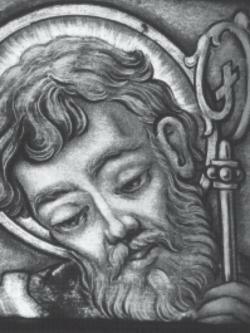 When a saint’s name was drawn the person was expected to imitate the life of the saint whose name they had drawn. Over time this new lottery lost favor with the populace. In its place the young men began a custom of offering women they admired and wished to court handwritten greetings of affection on February 14. Thus began the idea of Valentine’s Day cards. This didn’t sit too lightly with the populace. They began secretly getting married behind the emperor’s back. How did they accomplish this? There was a Roman priest, bishop of Interamma, by the name of Valentine. He thought the emperor’s orders were unrealistic so he secretly began marrying people. As one might expect Valentine was soon found out, arrested, put in jail, and sentenced to die. letters to those in his parish and is said to have always signed them “From your valentine.” Valentine was eventually beheaded on Palatine Hill at the site of the ancient altar to Juno. 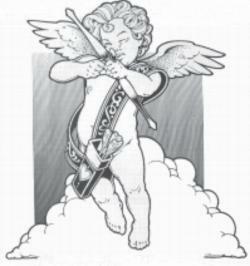 Since this time Valentine was considered a martyr who sacrificed himself in the name of true love. In the fifth century the reigning pope declared February 14 as Valentine’s Day in honor of St. Valentine. The tradition of drawing names on St. Valentine’s Day continues in England and other places. Also the Europeans believe that on February 14 the birds began to choose their mates. This tradition of birds choosing their mates on St. Valentine’s Day led to the idea that boys and girls should do the same. This is a form of compromise that allows one to side-step a difficult issue. This is a way to avoid taking a stand for your beliefs and having to defend the basis of that belief. Most people today could remember the story of St. Valentine, but Lupercalia and associated deities of classified mythology are forgotten. We rarely study them or see any significance in our lives. The St. Valentine story motif has the elements of a good story: love, honor, courage, and sacrifice. But, let’s go deeper into the significance of Lupercalia and the mythology behind this. Ancient pagan fertility rituals have come down to our present time almost intact. The only difference in the ancient pagan rituals and their modern counterparts, is the fact that their names have changed in order to veneer them with Christian respectability. The Romans identified Lupercus with Faunus, a deity of nature. The Greeks called this deity of nature— Pan. Pan, the chief of the satyrs presided over rural occupations, was patron of fisherman, hunters and shepherds. The hunter, Nimrod, it is said, pursued wolves in the Apennine Mountains of Italy, and acquired the title of Lupercus - wolf hunter or hunter of valor. Remember, valens means to be strong, powerful, mighty. It is a documented fact that pagan customs were grafted into Christian religion. Although Christianity swept the world in a relatively short time as histories of great religions go, the early missionaries faced an uphill task. The pagans were reluctant to give up their false deities and ancient practices. So, missionaries, unable to convert them easily to an entirely new code of worship, did the next best thing. They took the pagan festivals as they were and gradually grafted the observances of the new faith into these festivals and the rites and customs surrounding them. Even though Christian missionaries took the pagan festivals as they were and gradually grafted the Observance of the new faith into their festivals, with their rites and customs, they are still abominations in the sight of Yahweh. When Yahweh thy Elohim shall cut off the Nations from before thee, whither thou goest to possess them and thou succeedest them, and dwellest in their land; Take heed to thyself that thou be not snared by following them, after that they be destroyed from before this; and that thou inquire not after their deities, saying, How did these nations serve their deities? Even so will I do likewise. Thou shalt not do so unto Yahweh thy Elohim; for every abomination to Yahweh, which he hath, have they done unto their deities; for even their sons and daughters they have burnt in the fire to their deities. What thing soever I command you, observe to do it; thou shalt not add thereto, nor diminish from it. For such are false apostles, deceitful workers, transforming themselves into the apostles of the Messiah. And no marvel; for satan is transformed into an angel of light. Therefore it is no great thing if his ministers also transformed as the ministers of righteousness; whose end shall be according to their works. But I say, that the things which the Gentiles sacrifice, they sacrifice to devils, and not to Yahweh; and I would not that ye should have fellowship with devils . Ye cannot drink the cup of Yahweh, and the cup of devils: ye cannot be partakers of Yahweh’s table, and the table of devils. Do we provoke Yahweh to jealousy? Are we stronger than he? 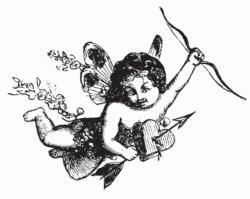 The most predominant symbol of the fertility rite of Valentine’s Day is the heart. In our country, the heart symbol has the same meaning as love. Almost everywhere one looks you can see examples of this symbolic representation of love. The heart is also a popular design for costume jewelry, saying love without saying it. Let us read a very revealing and astounding excerpt from Halley’s Bible handbook. This will certainly put “the heart” of truth into proper context: “The Imperial Church of the 4th and 5th centuries had become an entirely different institution from the persecuted church of the first three centuries. In its ambition to rule it lost and forgot the spirit of [Messiah]. The ideas connected to St. Valentine’s Day were brought to the United States and that day was first celebrated in the United States during the Civil War. No sooner does the Xmas celebration end that one finds retailers displaying their Valentine’s Day goods. Retailers not only target adults with the schemes displayed above, they target young children also. They encourage school children to purchase a card for each child in their class. If a class has 30 pupils and each buys a card for the other children, then that totals 870 cards. Multiply this by a small monetary amount for each card and this will total in the hundreds of dollars. Then, multiply this by the number of classrooms in the country doing the same thing and what do we have? A business venture not left alone. As we have seen, becoming involved with the celebrations of worldly holidays and special days points overwhelmingly to pagan symbolism. This we are to avoid. We must never place anything above Yahweh and His way of life. The celebration of these days only shows that the spirit of disobedience is running rampart in the world. But, Yahweh’s true spirit is here also and is available to all those who have a real desire to live according to His will. Yahweh has promised us a place in His kingdom if we are willing to obey His Truth. Don’t let satan beguile any of us. It is of utmost importance you recognize the true meaning of this and all pagan celebrations. Yahweh is most assuredly not for them. He hates manmade festivals. We must turn from them if we want to have a position of rulership in His Kingdom when our Savior, Yahshua, returns to set up that Kingdom. Servants of Satan! Now that is the truth without veneer or syncretic manipulation. That is a frank description of whom we obey when we acknowledge and honor Valentine’s Day. It seems harsh and certainly not politically correct, but truth feels that way sometimes. Now that we have identified this world’s holidays, the wrong ones to be associated with, what does Yahweh prefer? How does it happen that we are unable to correctly discern what is true and what is false? How does the world innocently accept a holiday like Valentine’s Day, which in fact has a history that leads you back to the deity of this world, satan? For our struggle is not against flesh and blood, but against the rulers, against the powers, against the worlds forces of this darkness, against the spiritual forces of wickedness in the heavenly places. Most people believe that is Yahweh’s world or certainly Yahshua’s world. But that is not true. This world was given to Satan to rule. He has twisted that opportunity and despoiled it. These Scriptures confirm that this whole world is under the influence of Satan and his demons, who are able to manipulate, deceive, and confuse at will. They construct history and culture to meet their needs. The symbolism used during the Valentine’s Day celebration is just another example of their work.